Lately there has been a lot of discussion on the topic of clothes dryer heat recovery systems. I thought our blog readers might be interested in hearing about some of the ideas that our forum users have come up with. Many different techniques have been discussed. The first mentioned is simply a finned aluminum tube that would radiate heat into the room. There was discussion of a thermally activated fan to improve heat recovery. Another design brought to us via a youtube video (shown above). 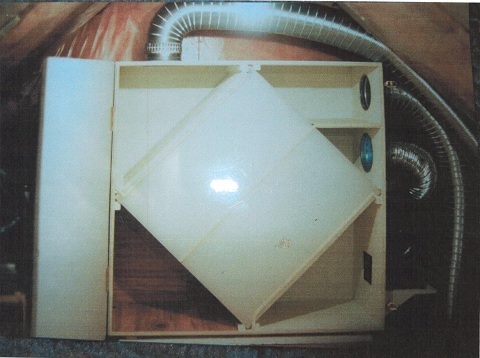 It shows a 55 gallon drum used as a heat exchanger. This is the only prototype that has some decent data that I’m aware of. As you can see, he is recovering a fair amount of heat with this relatively simple system. Yet another design GaryGary (a forum user) is considering, is using a DIY version of a HRV type cross flow heat exchanger. GaryGary has already run some interesting tests showing that one load of laundry has roughly 4.5 kWh of heat available for recovery. That is over 15,000 BTUs. He claims this is his largest single electric load in his house. So, if you have any interest in dryer heat recovery I’d suggest taking gander at the forum and see if anything looks like it might work out for you, or help others work out their system.